An example of the Impulse from Winsted Winsted Corporation announced the recent opening of the Pro Video Solutions Center in Dallas, a facility that features the Impulse and E-SOC product lines of Winsted consoles in a fully integrated capacity. Designed for control room end users, dealers, and consultants to test AV technology in a real-life setting, the Solutions Center highlights Winsted consoles integrated with video walls, projectors, and network operations technology. 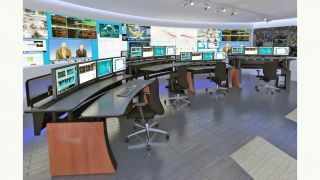 With this unique arrangement, buyers can experience an entire control room setup and test numerous technology options before making purchases. In an industry where digital and printed catalogs are still the dominant means for purchasing technical equipment, the Solutions Center is a new concept designed to help manufacturers connect with control room end users, dealers, and consultants. The Solutions Center features nearly 3,000 square feet of demonstration space that includes a network operations center, boardroom, and huddle/training room. Winsted products featured at the center include the Impulse line of consoles, which combines ergonomics and operator comfort. Two independently adjustable, ergonomically curved work surfaces can be raised and lowered to meet the needs of individual operators while offering flexibility between sitting and standing. Also available are Winsted’s E-SOC consoles, which feature Winsted’s Versa-Trak monitor mounting system for ergonomic comfort and adjustability. The control stations and command consoles include lift-off access panels, integrated cable management, and a hinged corner for a flexible and feature-rich solution.